37 pages. 21 color reproductions. Paperback. Text from an interview conducted by Tim Adams for The Observer on June 2, 2001. Published on the occasion of the exhibition Sculptures by Juan Muñoz. 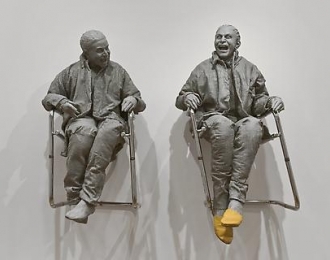 Juan Muñoz belongs to a generation of artists that dominate contemporary figurative sculpture and installation. The artist regarded himself a “storyteller,” making his sculpture a means by which to tell his stories. Muñoz treated each installation as unique believing a different context gave the works new power and meaning. His reoccurring characters, the dwarfs, the Chinese figures, the people on the balconies perform as actors rather than individual sculptures. One of his main concerns throughout his career has been the interplay between the figure and the surrounding architecture. His work, and in particular his large-scale installations, explores just that.